Summer is on its way, and if you love swimming and enjoying water sports, you probably own or are planning to rent a boat. While boating is extremely fun and exciting, it’s important to practice safe boating every time you’re enjoying the water and sunshine. While you may think that you just need to make sure that you have enough life jackets for everyone on board and a full tank of gas so you can get back to the marina, there are some often overlooked safety rules that are important to both your safety and your passengers. If you’re planning a boating trip or day on the lake, make sure you remind everyone on the trip of these important rules before leaving the dock. While it may seem like overkill to read off a list of safe practices to follow, knowing what to do in an emergency could save someone’s life. Also, practicing safe boating and being attentive of other boats on a crowded lake is also vital to both your passengers and the passengers on other vessels. If you’ve been the victim of a boating accident, contact The Law Offices of Alex R. Hernandez Jr., PLLC. Experienced in personal injury law, our dedicated lawyers will review your case and can help you get the compensation you deserve. If you’re in the Victoria or Corpus Christi area, call us today. Here in Texas, weather is sometimes pretty unpredictable. Thunderstorms, hot temperatures, and humidity can all play a part in making an exciting day on the water turn bad quickly. Make sure you check the weather before planning a boating trip, and if there is any chance of rain, it’s probably best to wait for another time. While you are on the water, check the radio often for weather updates. If you notice dark or swirling clouds, strong winds, or thunder in the distance, get off of the water as quickly as you can. Monitor temperatures — a sudden drop can herald an oncoming storm. If temperatures are soaring and extremely high, bring plenty of water and try to stay out of the sun during the hottest part of the day. Apply sunscreen and wear a hat or rash guard so you won’t burn in the sun. Make sure your children also wear sunscreen and adequate sun protection as well. You’ll enjoy your day in the sun and water without suffering a sunburn or dehydration afterwards. Enjoying a cold beer during a hot day is certainly relaxing, and alcohol is often present during boating trips. Unfortunately, drinking while operating a boat is never a good idea. The effects of alcoholic beverages are exacerbated in the hot sun, and it’s easy to become dehydrated quickly when you’re perspiring and drinking heavily. Often, individuals don’t feel the effects of alcohol until it suddenly hits him or her like a ton of bricks. You definitely don’t want to suddenly feel ill while operating your vessel. Operating a boat is also dangerous when you’re drinking as your mind is altered and it can be hard to focus on steering and adhering to speed limits. 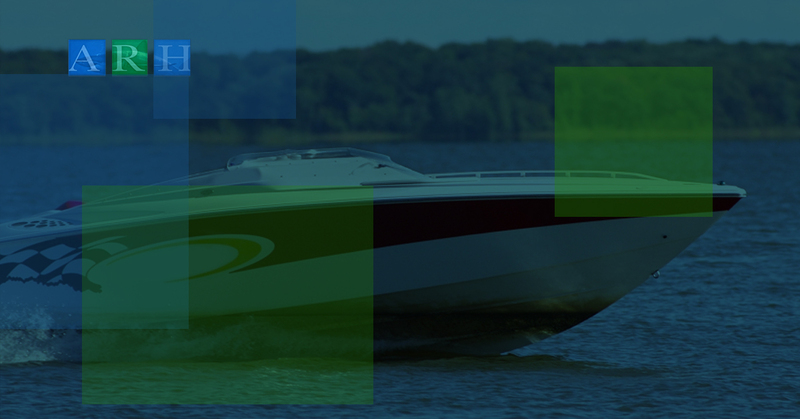 Alcohol is often involved in boating accidents, and it’s been proven that the probability of accidents doubles when the individual piloting the boat has consumed several drinks. If you do plan to drink, make sure you’re drinking plenty of water and eating regularly so you won’t intensify the effects of the alcohol. If you do find yourself to be under the influence, ask someone else to steer the boat home. If a law enforcement officer notices that you’re piloting a vessel while inebriated, you can be subject to fines and even be placed under arrest. Finding someone else who knows how to operate the boat is extremely important to the safety of everyone on the boat. If you happen to feel sick, drink too much, or get injured, having someone who can get everyone home safely will save a lot of stress for everyone. Being safe is the most important aspect of a boating trip, and you’ll be able to relax during the day knowing that someone else can handle the boat and make sure all passengers get back to shore safely. Before leaving the marina, go over the controls, mechanisms, and operations of the boat with the other pilot and give him or her an extra set of keys if possible or if yours happen to be lost. Also make sure that he or she knows where the boat’s registration and other important papers are, and that his or her boating license is up to date and is on board with the individual. Even if everyone on the boat knows how to swim, it’s important to have a life jacket for everyone on board. If there happens to be a passenger who does not know how to swim, he or she must wear a lifejacket at all times. They can be hot or uncomfortable, but if an accident were to happen, it could be the difference between life or death. The majority of drowning victims is because of boaters not wearing their life jackets at all times. Any children on board should also be required to wear a life jacket, and it’s vital to their safety to make sure it fits properly. Before leaving the dock, ask everyone to try on their life jackets so that adjustments can be made. Once everyone has tried on the vests, keep them at arm’s reach so if needed, they can be accessed quickly. Make sure to list the types of signal or communication equipment on board the boat. Test your communication equipment before disembarking, and check battery levels as well. Don’t rely on your cell phone, even if you think you’ll have service out on the water. While cellular service is becoming more and more accessible in rural areas, there is no guarantee that you’ll have enough bars to place an critical emergency call. An oversight of communication could land you and your passengers in hot water, figuratively. Have several emergency flares or beacons to allow emergency personnel or law enforcement officers to find you at night. If your boat happens to malfunction or run out of gas and the sun is setting, a flare will mean the difference between a rescue team finding you quickly or searching for hours. A fully stocked first aid kit is also important in case of accidents or an emergency. Make sure it has enough bandages, pain medication, and other supplies for everyone. Once this plan is in place, leave it with someone on shore, such as a marina officer or family member who is close by. He or she will know to alert the authorities if something goes wrong or you don’t return on time. It will also allow for the individual who is in charge of the list to contact emergency personnel and emergency contacts. This plan is vital to making sure you have someone looking out for your safety, which can save stress, worry, and even lives. If you don’t know how to swim, or you’re not the best as swimming well, it might be a good idea to enroll yourself in swimming lessons. While swimming may be rudimentary for some, many people are afraid of water or struggle to swim for more than a few minutes. In case you are stranded or waiting for rescue, understanding how to tread water, float on your back, and reduce panic will allow you to calm your body and save energy in a scary situation. Conquer your fears and take a swimming course. Especially as summer gets closer, many places begin to offer swimming lessons for all ages. You can even learn the proper techniques of rescuing someone who is drowning or who can’t swim so you can save a life, if needed. Often, swimming lessons are offered along with CPR certification, which is always an excellent skill to have in case of an emergency. Whether it’s only for enjoyment or ends up saving a friend or stranger, learning to swim with confidence is an invaluable skill you’ll have for a lifetime. If you’ve recently purchased a boat or want to be more adept at boating rules and regulations, taking a boating course will only improve your skills. Boating education varies from state to state, and it’s important make sure you know what is required in your state so you can operate your vessel with confidence and without incurring a fine. In Texas, you’re required to enroll and pass a boater education course if you were born on or after the first of September in 1993. You can check out the FAQ page on the Texas Boater Education website, and read more about boater education classes and locations as well. There are also affordable online courses you can take if you can’t spare the time to sit in a traditional classroom setting. These requirements may seem remedial for some, but making sure that everyone is safe and informed is the state’s desire and requirement. Don’t skip out on this vital course, even if you feel like you know all of the information already. Texas law enforcement officers will routinely patrol waterways and can ask for your identification cards at any time. Make sure everyone on the boat has an unexpired license or ID card, especially if there is alcohol on board. An open container on board a boat is legal in the state of Texas, but just like on land, if an individual is inebriated and is operating a vessel under the influence, he or she can be arrested. Also, underage drinking is prohibited while on a boat, so don’t allow passengers under the age of 21 to consume alcohol. Once you have your Boater Education Card, always carry it with you on board. If you don’t have it and a law enforcement officer asks for it, you can be fined. A Texas Boater Education card does not expire, so once you attain your certification, you’re set for life. You can keep a duplicate on board in case you’re worried you might forget to grab it. Enjoying the water, friends, and the experience of being on a boat is a fun and memorable experience for many Texans. While swimming and boating is a huge part of summer for most, practicing proper safety and knowing the rules will ensure a pleasant time for everyone involved. If an accident has occurred on the water and you’re in need legal advice or representation, call The Law Offices of Alex R. Hernandez Jr., PLLC. We’ll look over your case with absolutely no obligation to you, and can represent you in a personal injury case. Sustaining a personal injury is difficult for both you and your family, and we want to help you get the compensation and justice you deserve. If you’re in Victoria or Corpus Christi, Texas, contact us. Our compassionate and understanding team will handle your case with professionalism. Call now!